This is a weekly tool provided by RosterWatch. 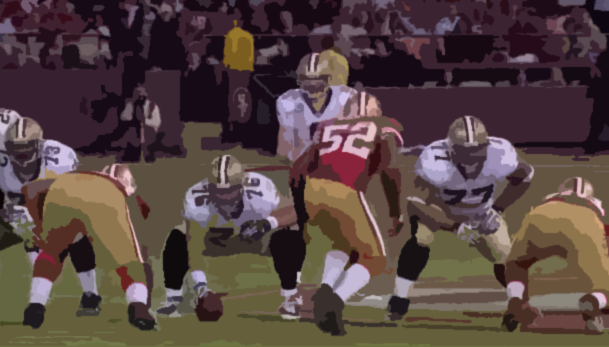 It is designed to be a decision-making tie-breaker for gauging the defensive opponents your fantasy players face. It should optimally be used in conjunction with the snap counts and targets, and touches tool. 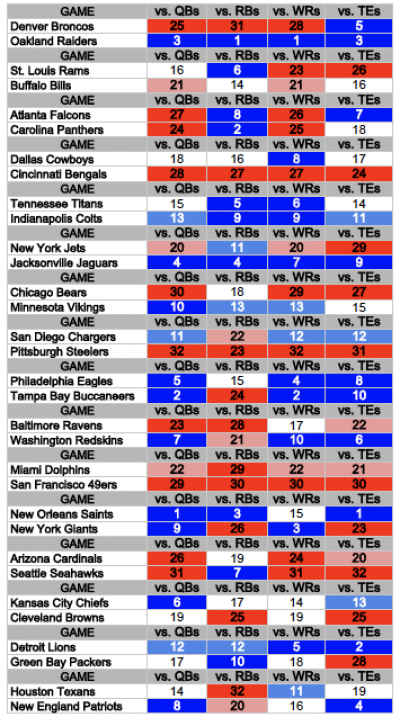 The rankings represented here are derived via a proprietary algorithm which takes into account not only standard “fantasy points against” metrics, but also weighted averages of separate individual player scouting grades for members of the unit that will be defending, pass rushing, or covering against the position in question. 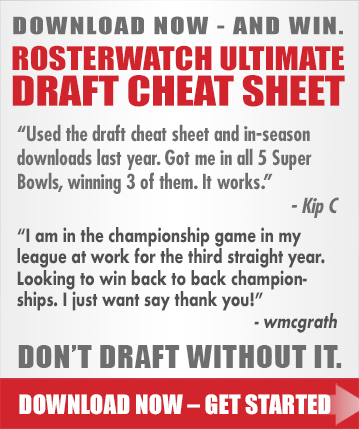 To use the tool, think about your fantasy player. Let’s say you own Giants TE Martellus Bennett, and would like to see how he matches up against the defense he faces this week. First look at the Giants’ matchup for the week, and see what the number is inside the “vs. TEs” cell for their opponent. As you will see, the Giants are playing the New Orleans Saints, who have a big, blue No. 1 in their “vs. TEs” cell. This is a great indicator for Bennett owners. Repeat the same process for other players on your roster as you are trying to decide which players to start and which to sit. “1″ is the best matchup, “32″ is the worst. Ok So based on your chart I should sit Ridley,Gore and B Brown which leaves me with only Murray and Knowshan to play at RB. Also whats the white blocks mean i.e. : The Houston QB box is white as is the TE box ? The white boxes just mean middle of the road matchups. Hope you started knowshon, if not, then keep those three in your starting lineups despite the matchups. Would you guys start McFadden his first game back versus a defense like Denver’s? Or would you pick up a guy like Owans for the Jaguars off of the waiver wire since he’s their only running back at this point?